Please see sizing chart below to determine the size of your dog for our product - We are NOT STANDARD SIZES so please measure your Dog's neck, girth and profile as directed below and order the size your dog's girth measurement falls under. Also please watch our videos on how to assemble Muffins's Halo on your blind dog inside the Assembly Information tab under the product. 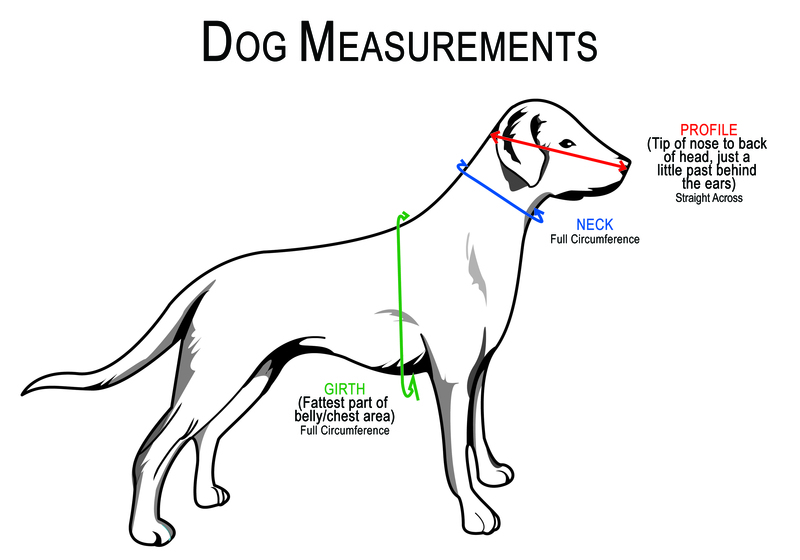 View Sizing Chart How to measure your dog. 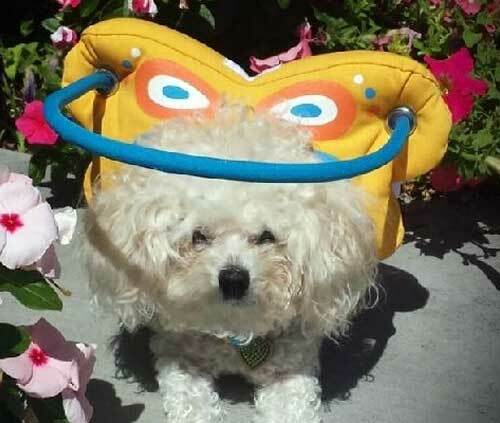 Muffin’s Butterfly Halo ® is a 3 piece must-have device that helps blind dogs transition. Becoming familiar with existing or new surroundings quickly. It starts as a harness wrapped snug around a dog’s neck and torso. The wing attaches to the neck of the harness. The halo attaches to the wing and when placed on neck of the harness, the halo is just above the eye level. Now the halo acts as a buffer to safeguard a blind dog’s head, nose, face and shoulders from bumping into hard surfaces. As the halo taps hard surfaces, it sends a signal to the dog alerting them to go in a different direction. They catch on very fast and it is truly amazing to watch their confidence level rise. Wearing the harness also makes them feel cuddled and less anxious. Material: Light weight and comfortable, made out of polyester/cotton twill and a stylish easy fit with adjustable velcro straps. Muffin’s Butterfly Halo does not hinder a dog’s normal daily activity. They can eat, drink, sleep and play with it on. Care Instructions For Wing and Harness: Cold water machine/delicate or hand wash and lay flat to dry. No bleach. Halo can be cleaned with a baby wipe or damp cloth. The fabric on Muffin’s Butterfly Halo is a durable water resistant nylon pack cloth. Our little Brussels Griffon, Carrie, loves her Butterfly Halo. She is blind due to cataracts. Because she is a brachycephalic breed (no nose) she kept injuring her eyes bumping into things. This resulted in several visits to the eye doc who recommended the Muffins Halo. It has been a life saver for her and her mommy and daddy. We no longer worry when she bumps into something because we know she isn’t hitting an eye as she zooms around. And Carrie knows it helps her and just turns and goes a different direction. She looks so cute as a butterfly and has received a lot of compliments. She has learned to manage it so well that if the Halo portion gets stuck on something, she always figures out on her own how to get unstuck. She is quite the Houdini which has caused not only some laughter but also amazement as we watch when she does this. Everything else looks great, Maggie looks so much more confident navigating through the house and even attempted running today, which she didn’t feel comfortable enough doing before. I can’t wait to take her to the dog park to show off her butterfly wings! Now I want one in each color! Hahah! Thank you again, seeing her happy and running today brought tears of joy to my eyes, and I’m forever grateful for that! Yvette isn’t totally blind yet but I wanted her to be comfortable with her Halo when the time comes. Her sister Michelle is blind and wears her Angle White wings. The butterfly on Yvette is so cute! I purchased the Butterfly Halo for my Grand dog Marti… I was told that Marti loves it ,and that she walks around much, much, more now,and that she seems so much happier now. I am grateful and thankful for the Muffin Halo,and so are Marti’s parents,and most of all Marti my Grand dog. I love the video’s they send me of her wearing her Muffin Halo,and navigating so well with the Muffin Halo makes me Happy to see her Happy. Muffins Halo changed my dog’s life. She lost her eye sight and hearing very suddenly and she became depressed very quickly. She was so scared of bumping her nose on things. She would cry whenever it happened and ended up not moving. She would just sit in one spot all day. It was heart breaking! My vet recommend Muffins Halo and it changed our lives! She now wonders around the backyard and has a much happier life! Thank you for helping me get my happy dog back! Four years ago, our little Spaniel, Sandy, suddenly lost her vision. Sandy was veey good at hiding it and it took awhile to realise what was going on, I did some research and discovered Muffin’s Halo, ordering one immediately, I was concerned that she might not like it, but within minutes she had figured it out! no more bumped nose! Sandy wore herbutterfly halo playing, sleeping, exploring the garden. It stood up to washingm and nudpughles! her little halo changed her life and brought back her confidence! truly a great innovation for blind dogs! Muffins Halo has been invaluable for our beautiful little girl Kea. As her eyesight has slowly deminished the Halo has protected her head from being bumped and her eyes from being scratched by bushes she can no longer see. More important she looks super cute when she is wearing it.